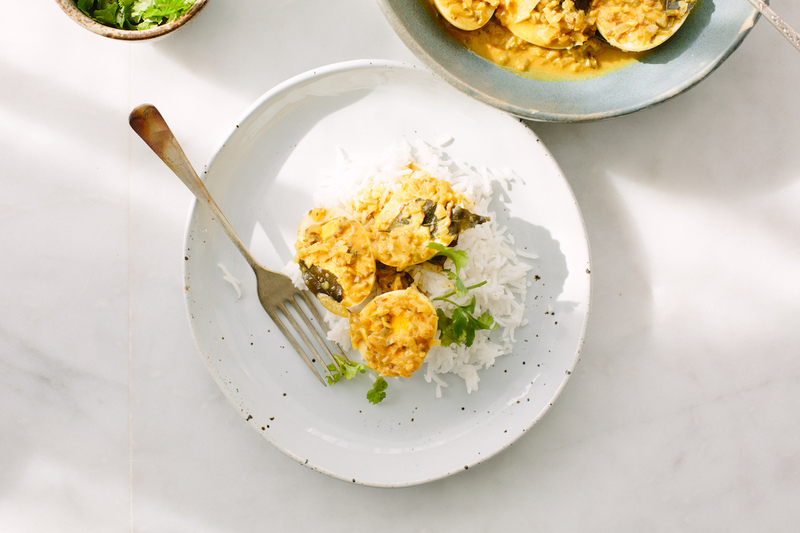 If you’re a fan of devilled eggs flavoured with a touch of curry powder, you’re going to love this simple egg curry. If you can get your hands on a Sri Lankan roasted curry powder (or make your own), use that. If not, try a good quality curry powder instead. Slice boiled eggs in half. Heat coconut oil in a medium saucepan over medium-high heat. Add mustard seeds and curry leaves and cook until the seeds start to pop. Add onion, garlic and chilli and cook, stirring often until soft and golden. Add fenugreek and cumin seeds and cook for a further 30 seconds. Add turmeric, coconut milk, water, curry powder, cinnamon and salt. Bring to the boil, then reduce heat and simmer 5‒8 minutes or until the sauce thickens. Stir in lemon juice and add more salt, if needed. Carefully add egg halves, spooning a little sauce over the tops of the eggs, then cook 2‒3 minutes to warm the eggs through. Serve hot over cooked basmati rice, scattered with coriander leaves.